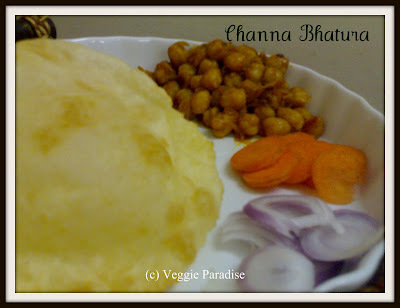 Channa Bhatura is an ultimate comfort food and also one of the most popular breakfast in North India. In a bowl, mix all the ingredients well using sufficient water. Finally add the ghee and knead it well, until it forms into a soft dough. Cover with a wet cloth and keep aside for 3-4 hrs. Take a lemon sized ball from the dough , dust it in flour and roll them into a flat and round shaped one. Heat oil in pan and deep fry them. 2 cups of chick peas (kabuli channa). Soak the chick peas in water overnight or for 6 hrs. In a cooker, cook the channa with a pinch of salt. Allow it for 3 - 4 whistles. Drain the excess water and keep it aside. Add chopped onions and saute them well until they turn translucent, add the ginger- garlic paste. Then add the chopped tomatoes and saute them well, until all are well cooked. Add the turmeric powder, chilli powder, garam masala powder , salt and stir them slowly on medium flame. Now add the drained chick peas with a glass of water and bring it to boil until the gravy thickens. At the final stage , add the coriander and lemon juice, stir it well. nice combo channa and puri! !nice presentation..
Bhatura loooks pufffy n crispyyy ,,looks perfect. Makes me mouthwatering with beautiful snaps,,, wooow,,superb Aruna,,, really delicious n yummmy one.thanks for sharing dear,,take care n keep smiling.. This is one of the dishes I order in restaurants when I want spicy food. This is irresistible and scrumptious! bhatura looks yummyy... looks awesome!! Bhatura one of my fav.Loved the way u presented...Perfect combination Aruna...All the Best. ohhhhhhhhhh, my tummy started to rumble..;-)) fab and all time fav..
Channa Bhatura cant be better than this. Its perfect! hey this looks so inviting..yummy platter..perfect..
Bhatura is too delicious..cute click too..yummy combo..
Really looks comforting and nice click too. 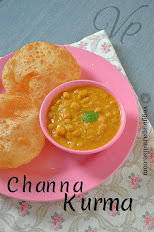 Look svery very delicious..cant resist ..Feel like grabbing the plate from pic..
Channa looks perfect and delicious. Channa bhatura is my favourite. Looks delicious and mouth watering. Thanks for your wonderful recipe. 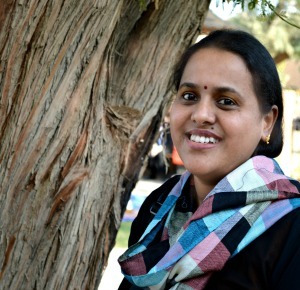 Love this mouthwatering entry, Aruna. Nice combo... looks mouthwatering Aruna. One of My Fav!!! looks so yummy!! its my fav..ur platter looks yummy..
Channa bhatura looks really good. 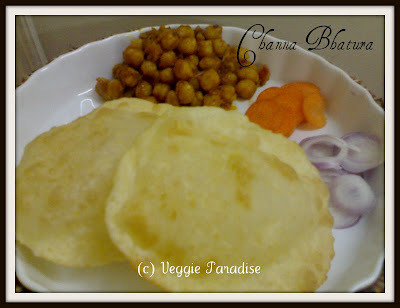 I always wanted to try Channa Bathura before and now after seeing it in your post, certainly will and should. It looks awesome! looks yummy yummy.. have to try it sometime..
my all time fav combo..
Looks Yummy.. Thanks for visiting my blog.. You have a cool space..
Its yummy. Wanna to much. The presentation is also perfect. Can I have one more plate? One of my favorite Chaat foods..I'm drooling!! Wow they are fluffy n iam feeling hungry now.I need that platter,will you pls pass them? I could not take my eyes off from them. Very yummy yummy delights...love the chole and Bature...the pics are so tempting.